ISS Elements: Docking Compartment-1 (DC-1) - "Pirs"
ISS-4R delivered Docking Compartment 1 (DC-1 - also known as "Pirs") the Strela Boom, and an Orlan spacesuit to the International Space Station aboard an unmanned Soyuz rocket. The launch configuration was a modified Progress spacecraft (Progress M-CO1) which consists of the Docking Compartment attached to a Cargo Vehicle Module (CVM). Progress M-CO1 docked with the forward Nadir (Earth-facing) docking port of the Service Module ("Zvezda "). Once the Cargo Vehicle Module stage has been detached, Docking Compartment 1 provides an additional egress and ingress location for Russian segment-based space walks. The Docking Compartment also provides an additional Soyuz and Progress docking port. 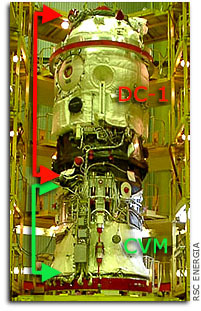 Prior to the arrival of the Docking Compartment, Soyuz and Progress Spacecraft could only dock with either the aft axial docking port of the Service Module or the Nadir docking port of the FGB. This added capability will allow a Progress spacecraft to remain docked to the ISS when a new Soyuz arrives to replace an older Soyuz. Prior to the arrival of the Docking Compartment, any Progress spacecraft currently docked to the ISS had to be undocked to allow the arriving Soyuz to dock.